In a new office, located in Google’s building at the west side of Manhattan, are new opportunities for the underrepresented in the tech community. The Black Girls Code (BGC), offers workshops for African American, Latinas and Native American girls that are interested in technology such as software development, video games or robotics. One of the mayor concerns parents have are the amount of time the kids spend in screens, either computers, tablets, television, phone or other, and maybe the reason is because it is unknown what they can get from it, what can they learn from this experience. How to become part of the process where kids access to the world thru technology and don’t look at it as an issue knowing that “this generation of youth are digital decoding, they are digital natives when it comes to technology”, as Kimberly Bryant, executive director of Black Girls Code says. Educating the newer generation guaranties the success of their decisions in life and that was exactly what the Black Girls Code was created for, to help girls to go into the technology field, teaching them mobile app development, robotics, game design. The difference between BGC and schools that teach the same subject is how accessible it is for girls, which are not commonly enrolled in these programs because the places are usually occupied by boys. Fees are not an issue either, while the workshops are affordable, scholarships are also offered as an enrollment option. Why is it located at Google’s building? 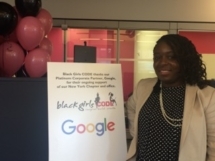 Because this company, Google, known as one of the most powerful in the market of technology was one of the early supporters of Black Girls Code and during the five years of its creation, volunteers and Googlers have come to be part of their workshops, creating an important partnership between Google, BGC and the students who become part of the program. Limiting the use of technology would probably not be the right way to help kids look to the future. The best way is educating them using it as a tool to achieve their goals. Black Girls Code is a great example of how to prepare new generations for the world outside the screens that they would normally only occupy. Where they can not just be consumers of technology, but creators.